A Post-Colonial Era? Comparing Mi’kmaq and Irish experiences of British colonialism. I primarily spent my research-stay in community in the border-towns of Donegal where I worked to build relationships that can allow for international solidarity between Irish communities here, and Mi’kmaq communities in Unama’ki. During my research-stay, I gained many invaluable insights that will contribute to my research project and my long-term goals of supporting Irish & Indigenous solidarities through historical research. When I first arrived in Ireland, I visited my host-institution, the School of Geography at University College Dublin. There I met with my field research supervisor and current chair of the Oral History Network of Ireland, Dr. Arlene Crampsie, and discussed my strategies for building relationships with community members, identifying relevant archives, and attending museums and historic sites in the area. Before leaving Dublin, I visited Kilmainham Gaol, where I got to explore the site that had been used to incarcerate political prisoners during the Easter Rising, the Irish Civil War, and the War of Independence. I also spent time listening to recordings from the Urban Folklore Project, from the National Folklore Collection, which contains oral histories and descriptions of life in Dublin during and after the 1916 rising. One interview in particular, with Kevin Doherty describes how his father was arrested for being a volunteer in the 1916 rising. In Inishowen (Donegal County), the O’Doherty clan is widely remembered for their resistance to the Ulster Plantations and resistance to British-rule. Kilmainham Gaol also had an exhibit on about the history of Irish solidarity with struggles against apartheid in South Africa. To me, the concerns raised about apartheid resonated deeply with current concerns being raised by allies of Indigenous nations. In Donegal, one of the first sites I visited was O’Doherty’s Keep and the heritage trail in Buncrana. 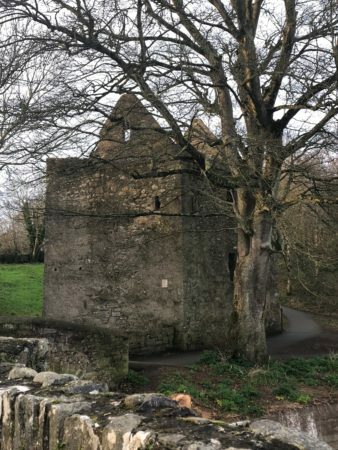 The Keep dates back to around the turn of the 17th century, when the O’Doherty’s were supporting Spanish and French resistance to the British. Nearby, the mansion known as Buncrana Castle was used to incarcerate Theobald Wolfe Tone during the 1798 Rebellion. In and around Buncrana I visited many British forts that date back to this time period and the British efforts to prevent foreign troops from entering Ireland during the Napoleonic era. When planning my research stay, I had decided to stay in Bridgend, which is about a five minute drive to Derry. However, I ended up staying in Buncrana because it is used as a central hub for work, shopping, and leisure in the region. Buncrana is also only about a twenty-minute drive to Derry, and many of the people who spoke with me there lived, worked, or had family on either side of the border. The way that these community members have created shared histories on both sides of the border make it an ideal place to network while doing my research. While seeking to find more information about Buncrana’s history, I initially went to the Buncrana Library where the West Inishowen History & Heritage Society had previously held their weekly meetings. There I found that the library hosts an impressive section of local history books. After reaching out via email to the society, I was connected with their local genealogist, Tina Porter. Tina helped me identify many topics that I could explore in the County Donegal Archives in Lifford, and suggested that I look into records of land seizures and evictions of Catholic peasants during the Great Famine; the rise of informal hedge schools in the area when education for Catholics was banned; and the families from the border-towns that were directly part of the revolutionary class that led to the formation of the Republics’ first Dáil. In the nearby town of Letterkenny, I also discovered an impressive library with historical archives in it and the County Donegal museum. During my visit to the town, I was invited to see a sheep farm during lambing season in the surrounding countryside of Lettermore, Drumkeen. There I got to learn about how the farm plots in the area had remained allocated in the ways they had been distributed under British-rule (via religion). In an obvious similarity with Indigenous communities who had been pushed off of their arable land and hunting grounds in much of Canada, the Irish Catholics had historically had to work to support themselves off of land that was deemed to be less supportive of agriculture. 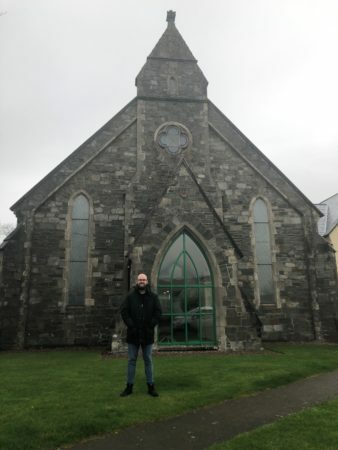 To contrast my experience doing research in the border-towns, I visited the Gweedore Gaeltacht, which is the largest Irish-speaking parish in Ireland. The region differs from the East in that it boasts a large amount of traditional Irish cultural production (something that is quite like the immersion schools and revitalization efforts of Mi’kmaq cultural producers). The Gaeltacht area also has a different history from the time-period of the Ulster Plantation on-ward. Travelling there, the differences and separation between the two regions was made material by a large range of mountains that gave the Gaeltacht a majestic and almost insulated feeling. Shortly after I arrived in Donegal, a car-bombing in Derry shook the community. While every community I visited during this trip was discussing British-rule in Ireland and Brexit, the difference in the social concern around these issues in Derry was palpable. I visited Derry about a week after the bombing and met many community members who were gravely concerned about the potential return to a hard-border. I also learned that at the end of March 2019, the environment in Derry post-Brexit might be further complicated by the scheduled announcement of the British government’s decision on whether or not they will prosecute the soldiers who killed civilians during the Bloody Sunday Massacre. Visiting the Tower museum, I got to explore Derry’s history from a unionist perspective. This made for an interesting contrast with my experiences on the Bogside history tour and visit to the Museum of Free Derry. Our tour leader, George, was living steps from the site of the Bloody Sunday Massacre when it occurred. During the tour he shared his extensive personal knowledge of the history of Derry since the beginning of the Derry civil rights movement. 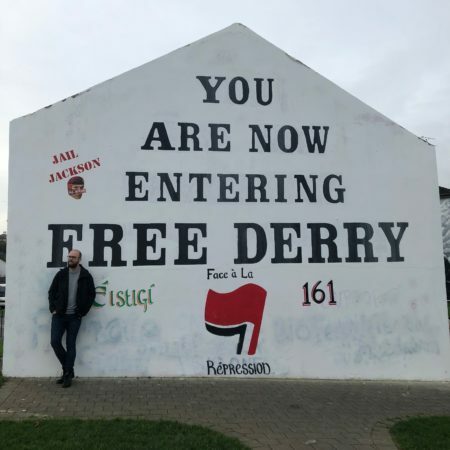 It is perhaps because of how recent the memory of the Troubles are in Derry, that various signs of anti-colonial solidarity are present when walking around the city. During my visit, I was able to spot a raised Palestinian flag, the inclusion of a (supposedly) Cree Proverb on a pro-Republican sign, and murals of Latin American revolutionary Che Guevera. Beyond these symbols of international solidarity, however, it does not take much to see that not far below the surface in Derry, the city itself is still in mourning. Murals, memorials, and testimonies adorned many of the streets we passed. While I had intended to do my oral-history interviews during this trip, numerous community members suggested that my interviews should take place after the Brexit deadline, so that I can compare my experiences in this trip with oral histories gathered in the border towns post-Brexit. 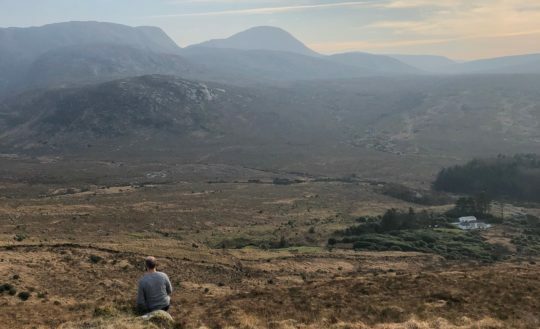 In response to these suggestions, I have chosen to schedule my interviews for June 2019, when I will be returning to Donegal for one month, before speaking at the annual Oral History Network of Ireland’s conference in Limerick.